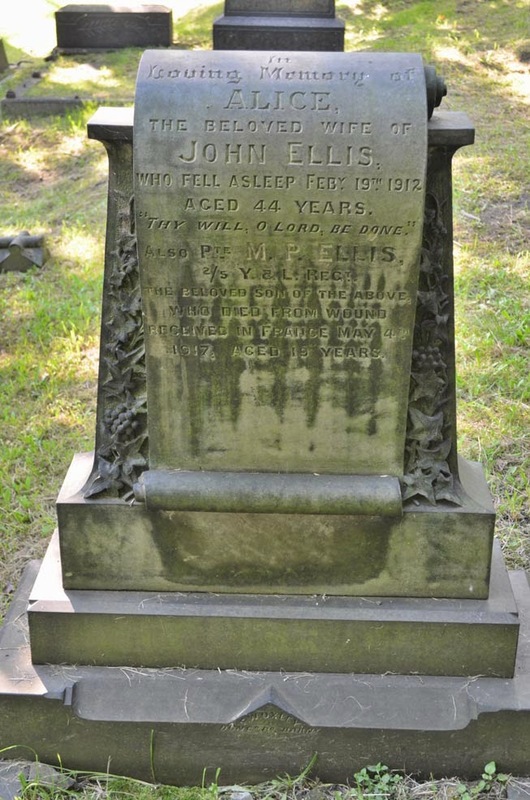 In Loving Memory of Alice The Beloved Wife of John Ellis Who Fell Asleep Feby 19th 1912 Aged 44 years "Thy will , O Lord, be done" Also Pte M.P. Ellis 2/5 Y & L Regt The Beloved Son of the Above Who died from Wound Received in France may 4th 1917, Aged 19 Years. He is buriedAchiet-Le-Grand Communal Cemetery, France and commemorated on the Commonwealth War Graves Commission website.